This bridge once served the McKeesport Connecting Railroad that connected the McKeesport Tube Plant with the Duquesne Works across the Mononogahela River. This bridge was only wide enough for a single track and measures 324 feet long. The view across to the McKeesport-Duquesne Bridge. I always enjoy the view going across on that bridge. Another look at the trusses. Everything I can find says that the bridge dates back to 1890. This dedication plaque on one of the beams says 1891. It is awesome to see this 124 year old bridge flourish in a new use. Just in the time I stopped to take photos, I saw dozens of folks cross the bridge. I am sure that at one point or another there were considerations to take this bridge down. Now it is thriving as a thoroughfare for the awesome Great Allegheny Passage Trail, providing a hub for recreation from Pittsburgh to Washington, D.C. The roundhouse that we talked about yesterday is located near the bridge. Perhaps we could see a cool little museum and rest station in the building for the trail? Maybe a nice place to duck into in the middle of a storm? I think there is lots of potential along the McKeesport waterfront to create a thriving center for recreation and employment for the Mon Valley. Today I decided to test my strength bicycling. As you may or may know, due to an injury last summer, I developed a chronic nerve condition that makes motion painful. Walking and standing vary in where and how much my right foot and ankle decide to hurt. It is not that bad, but I was unsure about my status in bicycling again. In my typical manner, I went into it full throttle and opted to get onto the trail at the old pumphouse for the Homestead Plant, on the far end of the Waterfront. The pumphouse is a lovely old structure that houses exhibitions and serves as a parking area to launch off on a journey on the Great Allegheny Passage trail. The GAP trail goes from Pittsburgh to Cumberland, Maryland where it joins with the former C&O Canal Towpath and makes its way all the way to our nation's capital, but not before it passes places like Kennywood, the post-industrial Mon-Valley, follows the Yough River to Ohiopyle, and reutilizes spectacular former railroad infrastructure. I was not sure if my journey would last five feet or if it would go for a while. Thankfully it actually hurts less to bicycle than stand or walk, which surprised me a lot. I ended up going 15 miles each way. I did not make too many stops because it would have taken ten hours if I stopped for everything I wanted to take a picture of. My first stop was to check out the Phantom and Thunderbolt in action at Thunderbolt. The vantage point is right down hill from the world's tallest terrain coaster, the Phantom's Revenge with its 228 foot and 85 MPH drop. Then we will head to the McKeesport Connecting Railroad Roundhouse. The massive element after the even larger second drop of the Phantom, along with the Thunderbolt, the other cliff traversing coaster in this shot. Such a great element. I think the third drop is just phenomenal. The most breathtaking part of the ride is this massive second drop. This cliff diving giant is like no other. Now for what I set out to post about: The former McKeesport Connecting Railroad Roundhouse. This roundhouse dates back to 1906 and judging by the disrepair of the building, it has been closed for decades. The railroad it once served closed in January of 2013. This is one of the few remaining National Tube Plant on this end of the property. Several large buildings still remain vacant but some development is starting to occur, making me hopeful that more employment is heading to the area. There is a MUCH smaller operation these days on the other end of the property, but the complex is no where close to when this plant was humming as a part of President Roosevelt's "Arsenal of Democracy." Oh yeah! Looks like a point of entry! NO WAY! As much as abandoned buildings fascinate me, I will not enter any for it is both dangerous and illegal. Any photos you see of defunct places will always be from the outside of the building. The door is open. I wonder who we can notify to get the glass repaired, anyone have a contact number for the owner ;-)? 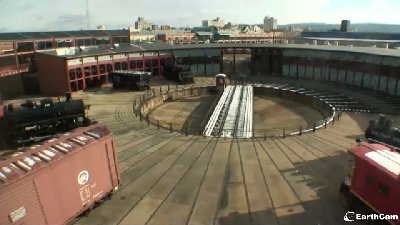 All kidding aside, I really hate to see folks neglect buildings like this, especially when places like Steamtown in Scranton, PA have their roundhouses fully restored and operational, this photo from the National Park Service. I hope someone either restores this roundhouse or finds an alternative reuse. You should go check it out though and explore the Great Allegheny Passage Trail because there are so many awesome things along it. I apologize for being quiet on this blog for a while. Work has been hectic and weekends have been full of amusement park fun. Follow these links to see our reports on our other blog from Knoebels and Kennywood. Additionally, I was also interviewed by NPR for our book "Great Pennsylvania Amusement Parks Road Trip". Needless to say, things have been pretty busy. Anyways, I was looking through my old photos and found this old photo of the old Philadelphia Spectrum. I miss this old arena. I am too young to remember seeing a Flyers or Sixers game at this old arena, but I did catch a few concerts and random events. I always enjoyed going into this arena. Sadly this venue was torn down a few years ago, but the legacy remains. Ten NHL and NBA championship series were held at the Spectrum, and it is also one of the few arenas that has held both a Stanley Cup Championship series and NBA Championship series. Overall, the building boasts four championships from the Flyers and the Sixers, including the Flyers consecutive championships in 1974 and 1975. The building last saw professional sports action in 1996. The Rocky statue from Rocky III once stood in front of the arena. The building was said to be the location of several major fights in the Rocky movies, with another classic venue, the L.A. forum, being the actual site of filming. Several NCAA tournament series were held at the arena, including the Final Four. The name was actually meant as an acronym for Sports (or South Philly) E for entertainment C for circuses, T for theatricals R for recreation and UM for "um what a nice building." This place was built to be a world class showplace. It held hundreds of concerts by pretty much any popular band you can think of from the late 60s to the 2000s. Tom Petty played at the Spectrum 11 times, Rush played 17 times, Billy Joel played at least 25 times, Springsteen 30 times, and the all time leader, the Grateful Dead, played at the Spectrum 43 times! The Spectrum was a must-stop place on any major tour. The building's replacement, the Corestates err........First Union.......errrrrrrr Wachovia.....errrr Wells Fargo Center is very nice. I wish they had continued to keep the Spectrum as a secondary showplace and sports venue as they did for 14 years, but I guess all good things have to come to an end sometime.